The Peyton Manning era in Indianapolis is officially over. It was to be expected, but it’s still rather shocking now that it’s actually happened. 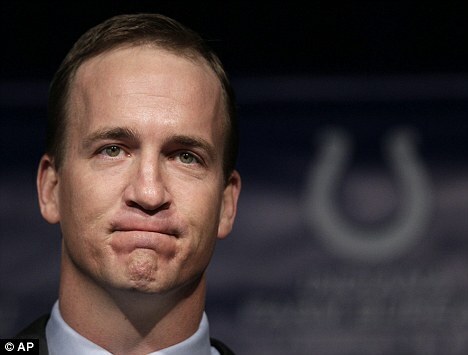 Peyton spent 14 years with the Colts organization. He made 11 pro bowls, won 4 MVP’s, 2 AFC Championships and 1 Super Bowl while playing in Indianapolis. After several neck surgeries and an entire season gone by, Colts owner Jim Irsay has decided to release Peyton Manning from his contract that was set to pay him a whopping $28,000,000 later this week. Instead of sticking with the man who took their once irrelevant franchise and turned it into a Super Bowl contender, the Colts will now explore other options at the quarterback position. That primary option being selecting Andrew Luck in the upcoming NFL draft. So what happens with Peyton Manning now? Reports are that he’s nearing 100% health and is ready to play right away next season. Despite his age (35) and history of injuries, Manning is still a huge upgrade over half the quarterbacks in the National Football League. So who will be the one that takes a chance on Manning? In this writer’s opinion, there are 3 teams that would look awfully good with Peyton behind center. This wouldn’t be the first time the Cardinals have taken a chance on an aging veteran. Do the names Kurt Warner, Emmitt Smith and Edgerrin James ring a bell? If the Cardinals can win 8 games with Kevin Kolb and John Skelton running the offense, just imagine what they could do with a future hall-of-famer in Peyton Manning calling the plays. 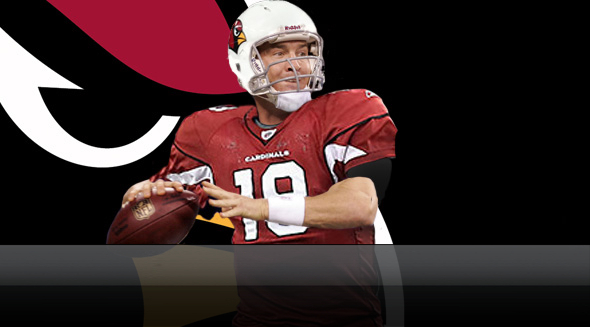 Throwing to the best receiver in football (Larry Fitzgerald) would just sweeten the pot for Mr. Manning. The NFC West isn’t exactly the most intimidating division in football. Outside of a 49er’s team that came out of nowhere to reach the NFC championship game last season, there just isn’t a lot of competition in the West. Playing the St. Louis Rams, Seattle Seahawks and the 49er’s weak offense/strong defense 6 times can be very enticing for a quarterback entering the twilight of his career. Qualifying for the playoffs becomes that much easier with the lack of true threats in the division. Peyton Manning would automatically become the new King of South Beach (Sorry Lebron) if he were to join Miami next season. The Dolphins have the perfect setup for Manning. The roster is built in a way that Peyton can come right in and take this down and out franchise and bring it back to respectability. He would have a running back who rejuvenated his career last season in Reggie Bush who can not only run, but catch balls out of the backfield. Add to that an elite receiver in Brandon Marshall and an offensive line with one of the best tackles in the game in Jake Long and you have the makings of a resurgence in Dolphin country. 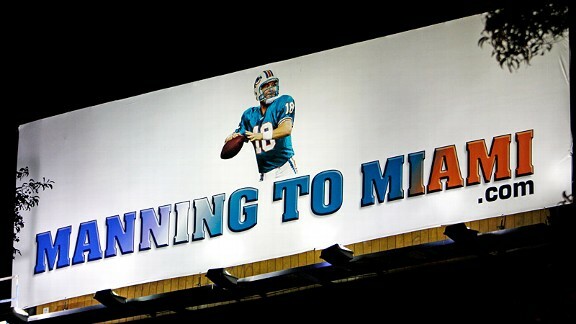 Miami has been starving for a star quarterback ever since the Dan Marino days. Peyton Manning would walk in and be that shining star for the Dolphins. It’s hard to have a lot of optimism for a team led by Chad Henne that has to compete with the likes of the Patriots and the Jets for a division title. Manning would give the Dolphins something they haven’t had in years. Besides, who wouldn’t want to see Manning battle it out with his long-time rival Tom Brady twice during the regular season? Before all of you crazed Tim Tebow fans lash out at me for this, just here me out. 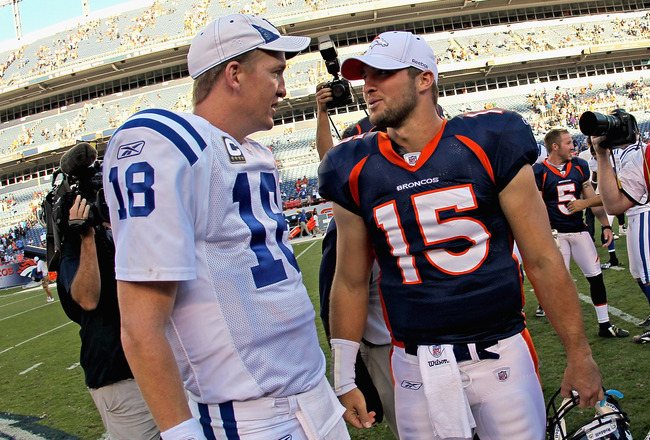 The Broncos would have Tebow step to the side and have Manning take over the reigns at quarterback in a heartbeat. The beautiful thing about it is that Tebow would more than likely be comfortable with that decision if it were to happen. Tebow did get Denver into the playoffs and help win a game against Pittsburgh, but he is still far away from being a great quarterback, at least when it comes to his techniques. Taking a season or 2 to sit behind Manning and learn the art and simplicities of the quarterback position from one of the greatest of all-time could do wonders for his career. He seems humble and decent enough to know that this would be best for the Broncos in the long-run. I don’t pay much attention to all of the fake slurping John Elway has been giving Tebow. Elway wants a quarterback that reminds him of himself. Throughout this whole ordeal, Peyton Manning has conducted himself with the utmost class, respect and dignity as a football player, a businessman and as a human being. He is sure to find success with whichever franchise he ends up with. This entry was posted in NFL and tagged Andrew Luck, Arizona Cardinals, Denver Broncos, Entertainment, Football, Indianapolis Colts, Jim Irsay, John Elway, Kevin Kolb, Larry Fitzgareld, Lebron James, Miami Dolphins, NFL, Peyton Manning, South Beach, Sports, Tebow-Mania, Tim Tebow. Bookmark the permalink.